Dogs and Cats. All Breeds. Call or Submit Form and Get Your Pet Groomed! Certified Professional Pet Grooming in your parking space. NO stress from travel and noisy visits to grooming shops. Your pet is handled in a clean, comfortable & sanitized environment. We do our best to accommodate our customers busy schedules. We come to you. Office or Home! Best Prices- Often Lower than Salons! 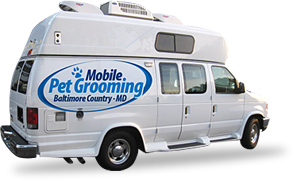 "Mobile Pet Grooming has been my sweet cocker Annie's groomer for several years � They truly love their little customers and they trust him. Annie will not let me groom her so she truly looks like a different dog when she comes back in. She looks, smells and even acts so pleased with herself! I would never let anyone else groom my little blond watch dog �Good job Mobile Pet Grooming. We Love You." "
"Mobile Pet Grooming has been my sweet poodle Annie's groomer for several years � They truly love their little customers and they trust him. Annie will not let me groom her so she truly looks like a different dog when she comes back in. She looks, smells and even acts so pleased with herself! I would never let anyone else groom my little blond watch dog �Good job Mobile Pet Grooming. We Love You." Is Mobile Grooming Right For You? Absolutely! Mobile Pet Grooming is all about bringing to you everything necessary for the complete comfort and well being of your pet. Most of our clients have been with us for a long time. They like being able to leave, do errands, and not worry about coming to pick up their pet from a salon or even having to be home at all. We are a 100% sure that Mobile Pet Grooming is the best choice for you and your best friend! Give Us a Call or Submit the contact form above. You will be glad you did. DON'T STRESS YOUR BEST FRIEND AND SAVE YOUR PRECIOUS TIME!